Student debate has the capacity to both deeply engage the students in relevant learning, and to encourage students to be deep thinkers. Debate is more than simply arguing. It has structure and rules that are designed to keep both sides calm. A wise teacher will also avoid generic, trite, or over-debated subjects that engender racial and ideological bias (marriage, marijuana, discrimination, etc.) and make the debate topics relevant to specific content that has been learned during the year. Done with a little bit of forethought, classroom debates will engage even the students that normally do not participate in class. Resource Development and Communications Manager for the National Association for Urban Debate Leagues in Chicago, Kerri Allen, shared with me the excellent success that the students in Chicago are obtaining academically because of being actively involved in the debating league. 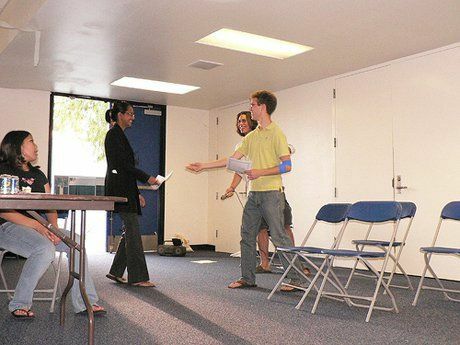 These debate teams are composed mainly of minority and economically disadvantaged students, yet because of their participation in debate, they enjoy a 90 percent high school graduation rate, as compared to 70 percent for their peers, and a senior grade point average of 3.23 as compared to 2.8 (3.0 being the established predictor of college success). ACT and SAT scores are higher, and the increased vocabulary (we discussed this already), as well as the skills of supporting argument with evidence, increased tremendously their likelihood of success in college. Below is the debate strategy and the associated debate techniques I outline in my book, Teaching Students To Dig Deeper: The Common Core in Action. The Great Debaters, a marvelous movie with Denzel Washington, demonstrates the power of debate as an educational tool to prepare students to be college-ready communicators. Aside from showing the drama and conflict of the times, it displays the rigorous training the debate team had to embrace in order to be prepared intellectually, to argue a point of view, to speak clearly and authoritatively, and to think critically on a moment's notice. Below are techniques that you can use in your classroom to make debate a college-readiness tool. Technique #1: Four Corners. An effective debate mixer is the four corners method. The teacher displays a topic on the white board/overhead/interactive whiteboard and assigns a different position relative to that topic to each corner of the room. Students then choose to stand in the corner that best reflects their personal opinion on the matter. Once the corners have been chosen then the teacher gives the students five minutes to create their discussion platform for supporting their position. The debate, or pseudo-debate, begins with each team presenting their opening argument then in turn, each team has time for presenting evidence and rebuttals, and then the closing arguments. Technique #2: Partner. In training for debates, some students are extremely shy and may work better with just one partner rather than a whole group. The process is the same as the four corner technique, but the debate is between two people, not the whole class. Technique #3: Devil's Advocate. This is a twist on the debate positions preparation. Instead of supporting their own opinion and platform, the students will also try their best to throw kinks into their supporting argument, so that, in essence, instead of preparing just one argument "pro," they also have to prepare one "contra." Technique #4: Worst-Case Scenario. This is another take-off of debate platform preparation. Students preparing to support their position look into the future at the worst possible thing that could happen as a result of the opposing argument, and prepare their defense from that point on. Technique #5: Glass Half Empty or Full. This is a technique to help the students view the different perspectives and prepare for arguments from each. Students look at their platform from a positive point of view and from a pessimistic point of view. Technique #6: Magic Wand. As discussed earlier, the magic wand can eliminate the constraints of reality. Also, the teacher can bestow wands that have certain limitations. For example, a wand may make people under 25 years of age, 20 percent smarter than they were before. The students would then have to adjust their platform argument to accommodate this peculiar restriction. The restrictive wands can work only for green eyes or other student characteristics, or only for those students from a particular class or teacher. Hopefully, these will give you some ideas of how to make debates interesting and challenging in your classroom. What kind of debate techniques have you found to be successful? Please share with us in the comment section below.